What is the 8-Stroke Breath for Stress Release? The 8-Stroke Breath for Energy and Stress Release is a yogic breathing exercise, or pranayam, that uses a technique called breathing in “strokes.” Breathing in “strokes” is where the breath is inhaled and/or exhaled in equal segments or “strokes.” Think of each stroke as a sniff and each sniff is lasts for the same amount of time, in this case 8 equal sniffs or strokes. The 8-Stroke Breath for Energy and Stress Release uses 8 equal strokes through the nose on the inhale and one long and powerful stroke through the nose on the exhale. The 8 stroke breathing requires you to focus on the breath and keep track of the number of “sniffs” you’re inhaling. Then exhale out the nose in one long stroke. Of all of the things you can do for stress relief, the 8-Stroke Breath for Energy and Stress Release cuts right to the chase and relieves stress fast and naturally. As always, different pranayams may affect people differently, so please try it and see how it works for you. If you have difficulty managing the 8-strokes do not be discouraged; a little practice will go a long way. This easy to do meditation uses breath work pranayam (pranayam) and taps into the life force energy–prana. This meditation was originally taught by Yogi Bhajan, Master of Kundalini Yoga, and can be found in Praana, Praanee, Praanayam: Exploring the Breath Technology of Kundalini Yoga as taught by Yogi Bhajan. The complete instructions for the 8-Stroke Breath for Energy and Stress Release is in this short video or scroll down below. How do I Practice the 8-Stroke Breath for Energy and Stress Release? Step 2: Body Posture: Sit in easy pose on the floor or sit in a chair, or edge of bed; maintain a straight spine. Set an intention to release stress from your body and mind. Hand Position (Mudra): Both hands are in Gyan Mudra (thumb and index finger touching), remaining fingers are straight, palms up and backs of hands placed on the knees. Eye Focus (Dhrist): Close your eyes and focus at the brow point (between the eye brows). Chanting (Mantra): Silent, focus on the sound of your breath. Step 3: The Meditation: Inhale through both nostrils in 8 equal “sniffs,” or strokes, then exhale in one breath (also through the nostrils). Time: Start with 3 minutes and build time up to 11 minutes. Step 4: End: Inhale deeply, hold the breath for 3-10 seconds (based on your lung capacity), and exhale completely. Repeat two more times. Relax. Checkpoint: Keep the breath strokes even on the inhale and be sure to exhale fully and smoothly in one breath. 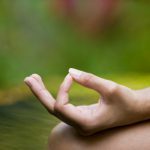 Why Practice the 8-Stroke Breath for Stress Release? Benefits: Increases energy to balance prana (life force energy) and apana (eliminating force), while releasing stress. Counting the breath focuses your mind on your breath pattern, and this will help you maintain your focus and learn to manage your stress. When is the Best Time to Practice the 8-Stroke Breath for Stress Release? Try it before bed for a restful night’s sleep or first thing in the morning. Find a time that works for you and try to be consistent as possible. Consistency is the most important factor when beginning a meditation practice. The results are cumulative and your resilience will increase with time. How Do I Know if the 8-Stroke Breath for Stress Release is Working? Keep a Journal. Once you are comfortable with the mechanics of the meditation begin a 40-day practice. This allows you to see how you’re doing over a longer time period. Often a friend or family member may see a change before you do. Optional HRV Feedback: If you have been trained in HRV Biofeedback you may want to follow your progress with your HRV feedback device. Practice HRV feedback either while you are practicing this meditation or right afterwards. It is important not to be distracted by the device while you are trying to meditate; if this occurs, then simply wait until the meditation is finished if you would like to document your progress. 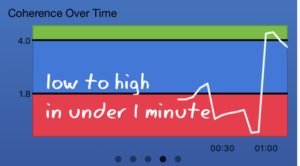 Before starting the 8-Stroke Breath meditation, I placed the HeartMath® sensor on my ear lobe and started the InnerBalance smart phone app. After approximately 30 seconds, my heart rhythm went from chaos (red) or low heart coherence, then into medium coherence (blue), and at around 1 minute I entered the zone of high heart coherence (green). 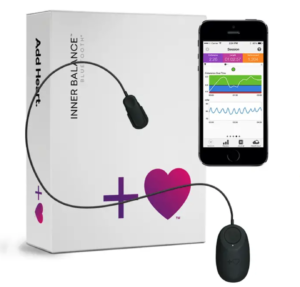 This 11 Minute Med is effective whether you are practicing HRV biofeedback with the Inner Balance Sensor from HeartMath in conjunction with it or not. If you like to have evidence-based data at your fingertips, then HRV feedback is a great tool to add while meditating. Just go for the GREEN zone and you know its working. Some of the links in this post are affiliate links. This means if you click on the link and purchase the item, I will receive an affiliate commission at no extra cost to you. All opinions remain my own. If you love blogging about topics and products you are interested in click here.